Torrance, Calif., January 27, 2017 — In 2016, Team Ryan Millen and the Rally RAV4 proved that a stock powertrain, front-wheel-drive RAV4 can be quite potent. This season, the Toyota Rally RAV4 and Millen are gearing up for more competition in 2017. Armed with new navigator and co-driver, Rhianon Gelsomino, the team will compete in the newly formed American Rally Association (ARA) series. In addition, the team will compete in select Rally America and NASA Rally Sport races. After competing in 12 races and two series during the 2016 season, the team walked away with multiple class wins, a rookie of the year title and 2nd place in the Rally America 2WD Championship. 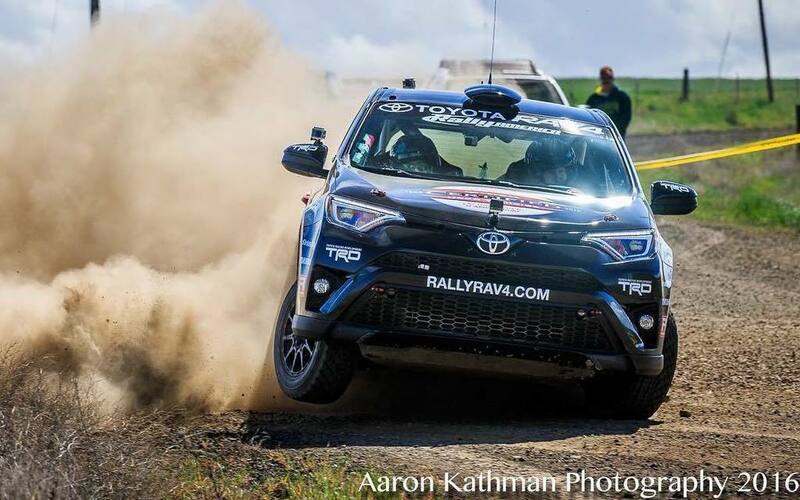 In addition, the Rally RAV4 and Millen captured the NASA Rally Sport National Championship for the second year in a row. Starting the season with a new co-driver and navigator can be challenging, but Millen and Gelsomino had a chance to gel last year after running together in select events. Gelsomino comes with over a decade of experience working with teams and drivers around the world, and will make a valuable addition to the Rally RAV4 program. The first event will take place February 4, 2017 in Maniwaki, Canada. The Rally Perce Neige consists of 143 stage miles of gravel roads covered in snow and ice. Gelsomino stepping into the role of navigator will allow Christina Fate to focus solely on team management. Both roles are critical to the performance of any rally team, so dividing and conquering should yield great results. Driver and co-driver chemistry is essential, but this year the team will have an advantage they didn’t have last year. They’ll be running for the second time at many of the rallies on the schedule. This familiarity could yield a real competitive advantage. As potent as Team Millen and the Rally RAV4 were the first time out, there’s no replacement for seat time. The RAV4, as in previous years, will continue to take on the brutal rally world with a stock engine and automatic transmission. Fans across the country were continually shocked and impressed at the potency of the Rally RAV4, which spins only the front wheels through a conventional six-speed automatic gear box. The Rally RAV4 this year will debut new livery with title sponsor JBL, and the continued support of Toyota Certified Used Vehicles, Yakima, TEIN, and Method Race Wheels. As one of Toyota’s best-selling vehicles, the RAV4 achieved another record year in 2016, selling more than 352,000 vehicles. That’s nearly 40,000 more than the year prior. More information on American Rally Association can be found at www.americanrallyassociation.org. This crossover is begging for a turbo. 2017 RAV4 Limited - Black/Cinnamon Softex, Advanced Tech Package, Mudguards and Door Edge Guards. Especially since they unceremoniously pulled the V6. I mean, a Lexus NX200 on the same platform already has a turbo standard. C'mon, Toyota! Please hire someone who does better Photo Shopped images; this shouldn't be hard to do.